The USS ROGERS (DD-876), a Gearing class destroyer, was commissioned on 26 MAR 1945. USS ROGERS served her country for 35 years, 6 months and 5 days, until decommissioned on 1 OCT 1980. JUL 1974 - OCT 1980 DESRON 37 / Naval Reserve Center Portland OR. Named for: Jack E. Rogers Jr.
Rogers (DD-876) was laid down 3 June 1944 by Consolidated Steel Co. Orange Tex. Launched 20 November 1944 sponsored by Mrs. J. E. Rogers Sr. and commissioned 26 March 1945 Comdr. C. B. Smiley in command. Following shakedown off Guantanamo Bay Rogers was converted to a picket ship at the Navy Yard Portsmouth Va. After further training in the Atlantic and Caribbean Rogers transited the Panama Canal and touched at San Diego before reaching Pearl Harbor 4 August 1945. With the termination of hostilities Rogers departed Pearl Harbor 17 August for Tokyo Bay where she arrived 31 August via Eniwetok and Iwo Jima. On 1 September she stood out of Tokyo Bay to join a fast carrier task group and commence her routine duties as a member of the 7th Fleet. Through the decade she rotated to the Far East for duty with that fleet on a regular schedule and in 1949 assisted in evacuating American nationals from China. Rogers participated in the atomic bomb test in Eniwetok Atoll in 1948. On 18 March 1949 she was reclassified as a radar picket destroyer (DDR) after a height finder radar and more communication equipment had been added and her torpedo tubes had been removed. 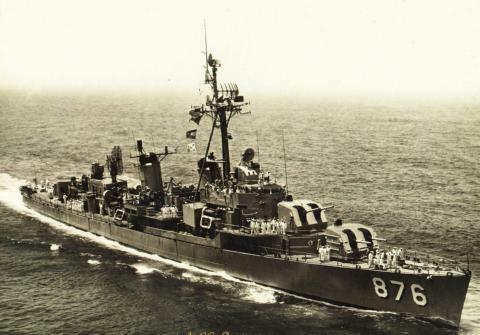 During 1951 and 1952 Rogers served as a unit of Task Forces 77 95 and 96 and participated in shore bombardment blockading and patrol missions in Korean waters. During this period Rogers also served as "lifeguard" destroyer for two Presidents: for President Truman's flight to Wake Island for his conference with Gen. Douglas MacArthur in 1950 and for President-elect Eisenhower on his return from the Far East in 1952. After fighting stopped in Korea Rogers alternated west coast tours with WestPac deployment. In 1954 she helped in the evacuation of the Tachen Islands. By 1960 Rogers had made over a dozen 6- to 9-month cruises to the Far East. After 1st Fleet operations off the west coast Rogers again deployed in January 1962 to WestPac where she operated with carrier groups on Formosa patrol and participated in a major Allied amphibious exercise. Rogers returned to the 1st Fleet and on the evening of 12 November successfully recovered one of Ticonderoga's pilots who has ejected from his plane into a dense fog off the coast of southern California. In June 1963 after 18 years in the Pacific Rogers departed San Diego for the east coast and FRAM I modernization at Charleston S.C. On 30 July 1963 she was reclassified from DDR-876 to DD-876. In May 1964 she returned to the Pacific Fleet. Two years later she was operating off Vietnam. Returning to San Diego in August 1966 she operated with the 1st Fleet off the west coast of the United States until deploying again to the western Pacific in September 1967. In mid-November she was operating in the Tonkin Gulf and in April 1968 returned to Alameda Calif.
Again operating off the west coast of the United States for the balance of the year Rogers deployed to the Far East in January 1969. En route she earned the Meritorious Unit Commendation for action in Hawaiian waters on 14 January coming alongside the port quarter of Enterprise (CVA(N) 65) with six fire hoses trained on the raging flight-deck fire while exposed to flying shrapnel from exploding bombs. After spending some of her time in the Far East off Vietnam she returned to San Diego 6 July. After a year of operations with the First Fleet Rogers sailed from San Diego for another Far East cruise. Following five months of service in the western Pacific she returned to San Diego 16 December. At the completion of another spring of west coast operations Rogers headed back to WestPac departing from San Diego 29 June 1972. She returned to San Diego 22 December and spent the next year on the Pacific coast of the United States engaged initially in normal operations. Later in early April 1972 she entered Hunter's Point Naval Shipyard for regular overhaul. Overhaul was completed by 28 August and she left Hunter's Point for various trials and refresher training which continued until mid-December. On the 18th she sailed for Subic Bay but had to return to San Diego three days later because of a medical emergency. She departed San Diego the same day 21 December and arrived in Subic Bay 29 January 1973. Returning to San Diego 12 June 1973 Rogers operated along the west coast throughout 1973 and into 1974. Rogers earned five battle stars for service in the Korean Conflict and three battle stars for Vietnam.